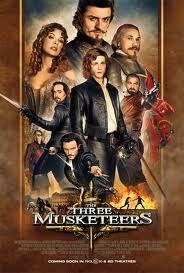 Screenplay by Alex Litvak and Andrew Davies, based on the novel "The Three Musketeers" by Alexandre Dumas. The year is 1625 and young D'Artagnan (Lerman) rides into Paris, immediately crossing paths with Rochefort, the feared captain of the King's guards (Mads Mikkelsen). He is rescued in the nick of time by Milady de Winter (Milla Jovovich). Not contend, and without realising who they are, he challenges all three Musketeers, Athos (Macfayden), Porthos (Stevenson), and Aramis (Evans), to separate duals. Before any of the duals can take place, the four are ambushed by Rochefort's men. They manage to hold off the guards and in the melee that follows, they retreat to fight another day. D'Artagnan realises that the three men are his father's old companions in arms and in turn, the trio take the young man under their wing. Their mission is to save France and the frivolous young King Louis XIII (Fox) from his arch enemies: Rochefort, his political master, France's Prime Minister Cardinal Richelieu (Waltz) and fellow conspirators, the Duke of Buckingham (Bloom) and de Winter. Paul Anderson's film is the latest adaption of Alexander Dumas the elder's much-loved classic masterpiece. The Three Musketeers has, among other things, adventure, excitement, romance, intrigue, chivalry and a host of undesirable but thoroughly interesting characters. In short, it's a filmmaker's dream and Hollywood had certainly realised this many decades ago. The coveted role of D'Artagnan for instance, attracted some of Hollywood's greatest (and not so great) names, including Douglas Fairbanks, the swashbuckling hero par excellence of the silent era (1921), to song and dance man Gene Kelly (1948), Michael York (1973) and Chris O'Donnell (1993). Of course, there were also numerous foreign productions, as well as a number of American TV adaptations. With all this in mind, the question is: did Anderson's film add any value to this well-established Hollywood tradition? Unfortunately, the answer is a resounding no. Lerman is surprisingly good as the exuberant and cocky D'Artagnan, while Jovovich more than holds her own as Milady and almost steals every scene. Macfayden and Evans are in good form. Mikkelsen is menacing, while Fox and Stevenson provide some genuine comic relief. Temple is positively radiant as the young queen. Yet Waltz as Richelieu is more of a cartoon character than a traditional villain and Bloom is disappointing. Despite always wanting to play a villain, he's hopelessly miscast as Buckingham. His acting is laboured, awkward and painful to watch at times. Also, carrying the 3D tag, and releasing hot on the heels of so many recent 3D failures (the notable exception being the re-release of The Lion King), makes you really wonder what Anderson was thinking. Add a convoluted storyline that contains many silly subplots, as well as flying battleships ships and you have the makings of a cinematic disaster on a grand scale. Dumas must be turning in his grave. If you enjoyed previous offerings of The Three Musketeers, particularly Richard Lester's 1973 version, you would do well to steer clear of Anderson's film. For a more exhilarating experience, try a walk down your favourite shopping mall.